Hi there! Funny title for this post, eh? 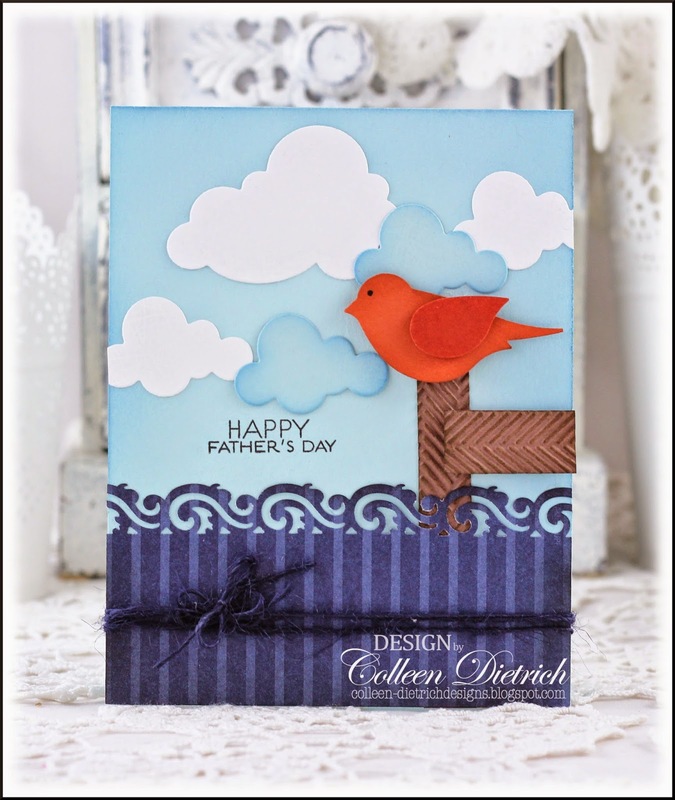 I happened to have this bird already punched out from another project and decided to create a nautical card using him. And so, he became a seagull. First-ever of his kind, perhaps. I intended to use only a couple of white clouds, but one mistake after another kept happening, and I needed a good cover-up. One such blue cloud hovers too closely to the sentiment, but it was either that, or an ugly glue spot. My dock could use a bit more work...it's rather crude. Good thing I don't build docks with wood! Yikes! Spring will be over before you know it. 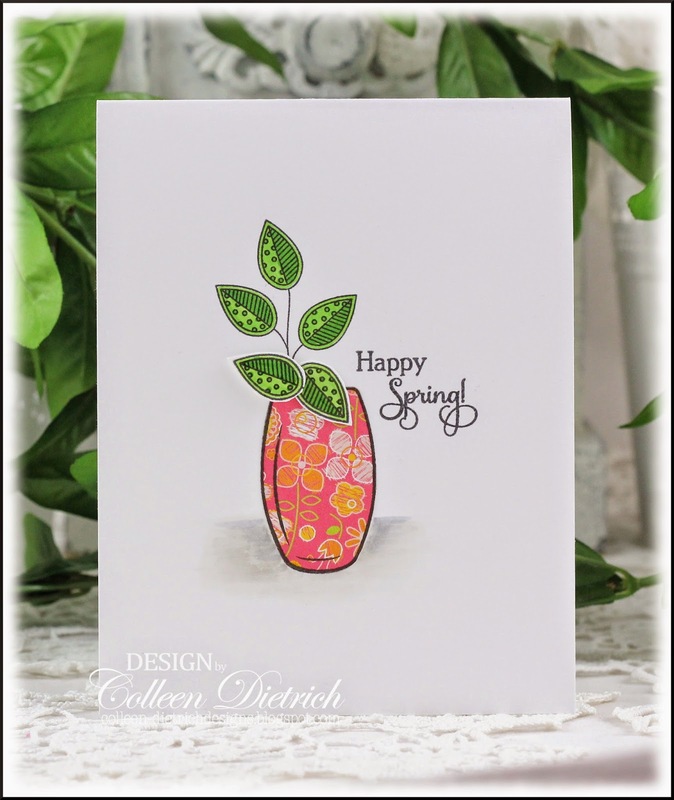 I wanted to share this card with you while it is officially still Spring....and not yet summer. Okay, there! Now Summer can come! It's my official start date at Seize The Sketch! Yay! You'll love the nice, easy sketch we have to work with these next two weeks, courtesy of design team member Lori Turner. Sooooo many options with this sketch, right? 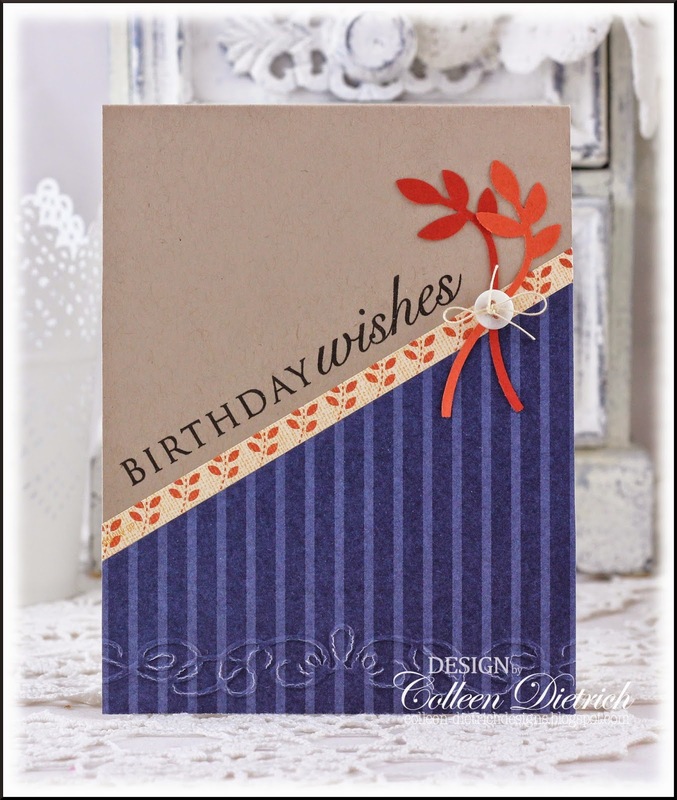 I fancied-up my version with a pretty embossing folder on the card base, then topped it with a few things. 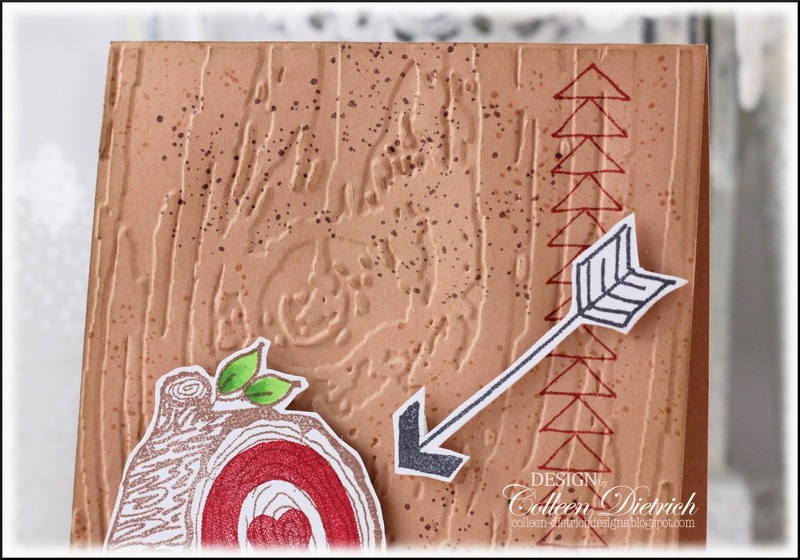 The little kraft envelope is a pre-cut diecut from Stampin' Up! (it's pretty old), and I added a smidgen of gathered lace inside. 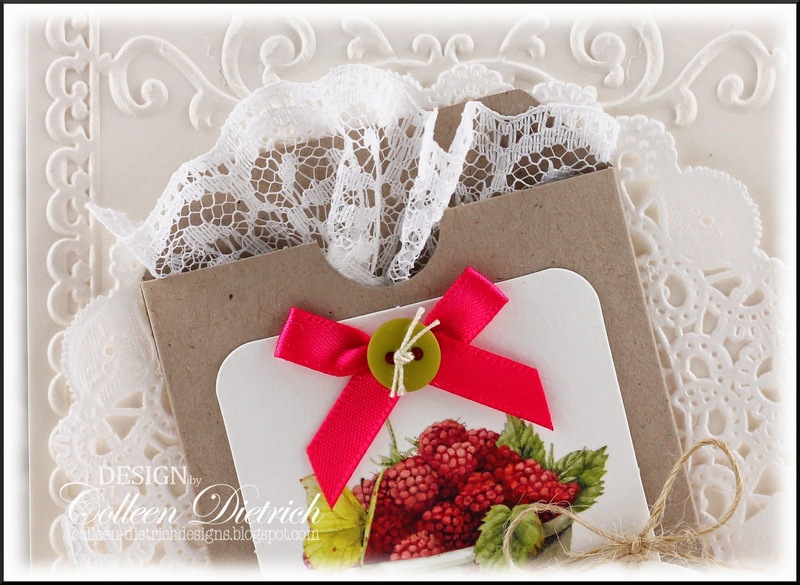 On top of the envelope, I used a bit of a Hallmark card that came just like this....rounded corners and bow untouched...but I added a button. Inside that Hallmark card was this lone raspberry image. I punched it out, added a twine bow and sentiment from Flourishes' Let Them Eat Cake. 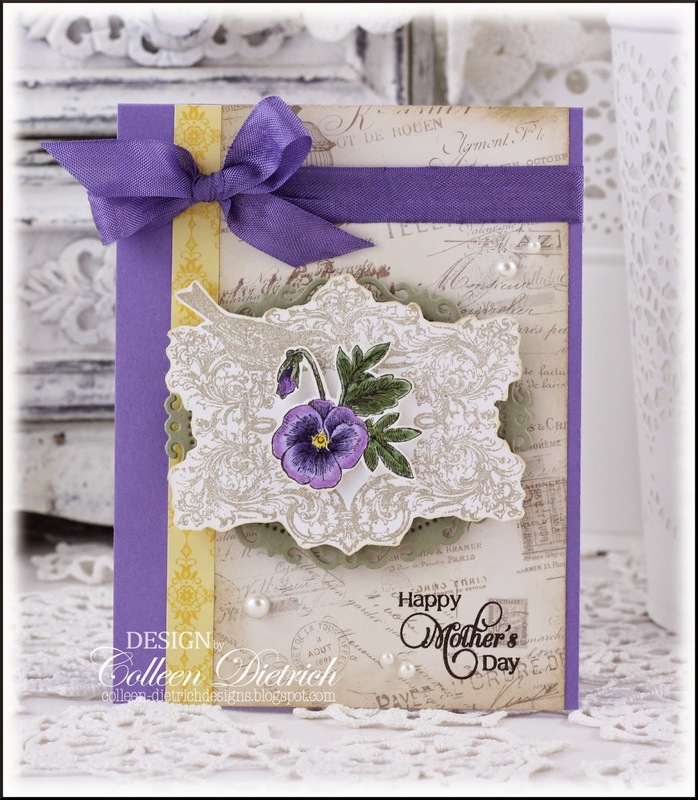 You can peek inside the card and see I've stamped a doily to coordinate with the front. Happy Saturday, and to you in the USA, Happy Memorial Day Weekend! Have any special plans? My husband will be putting up our pool, and we're having mulch delivered, so I know my time will be spent outdoors. I've got a card to share that is really simple, and I almost felt like I was 'cheating' by making it. 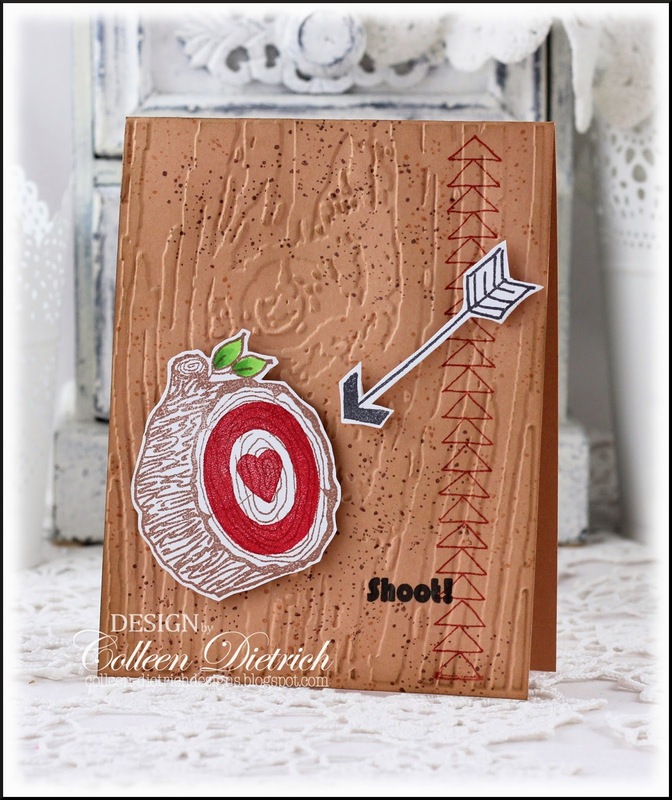 All the precut pieces of patterned paper and cardstock were in a little kit from one of those $1.00 Scrap Bags I get once in a while (from my Stampin' Up! 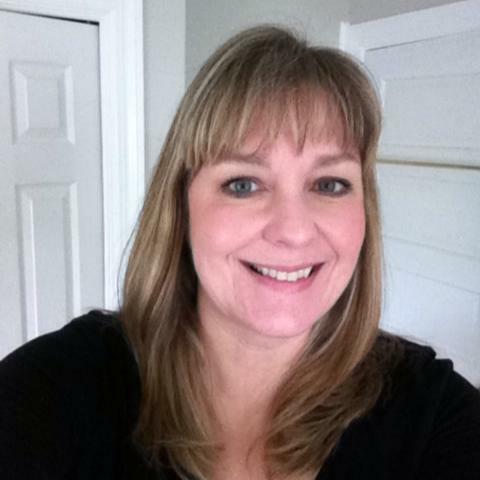 demonstrator, Gail). All I did was add some heart-shaped confetti, a rose, and a sentiment. You can see the confetti better in the picture below. 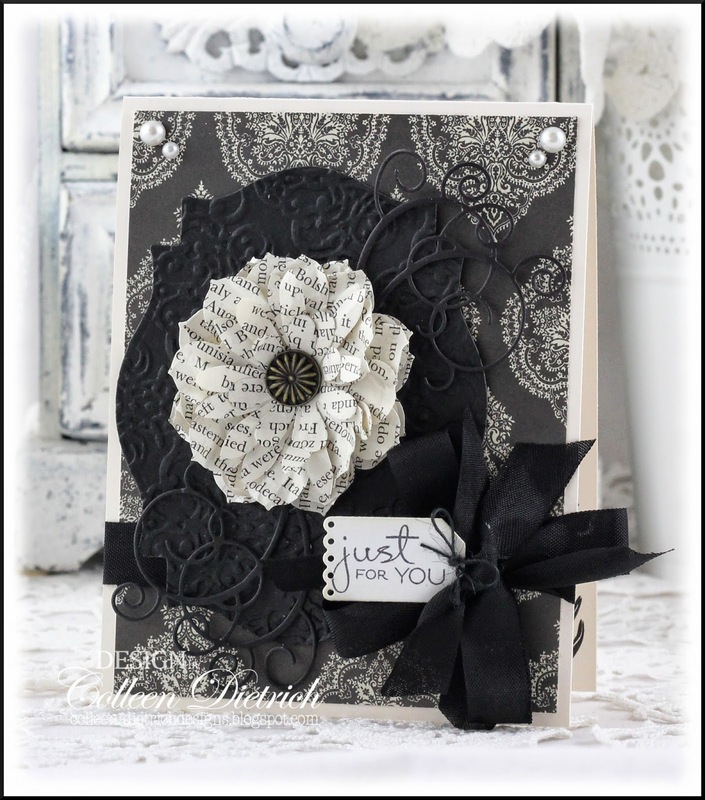 The sentiment is from Daily Designs Sentiments / Papertrey Ink. 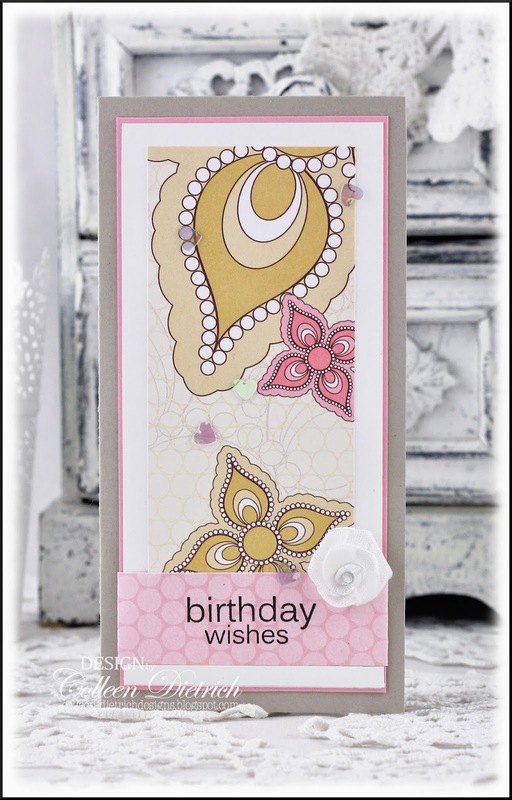 Do you ever find yourself wanting to CASE a card you've seen, because it's just too cute (or pretty) not to? That's the situation I encountered recently, after re-reading an older issue of Card Creations by Paper Crafts Magazine. Thank you, Tenia, for your inspiration! You rock! Well, hello there! 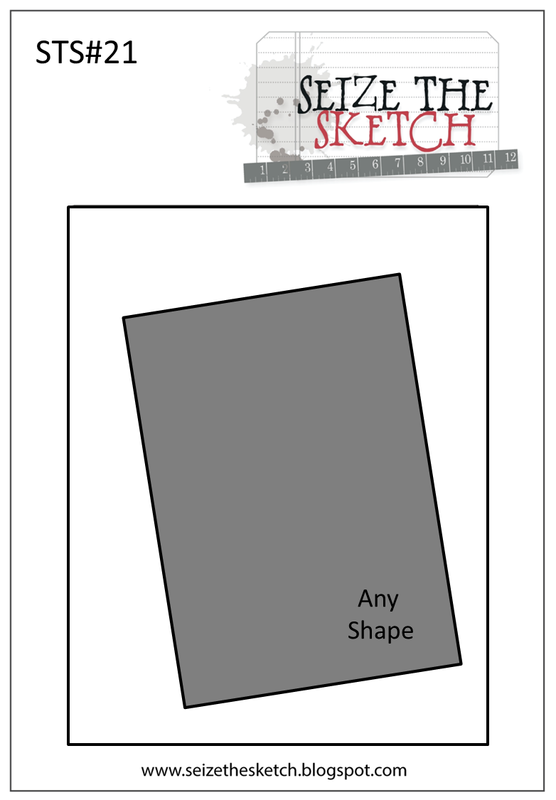 I thought for sure I'd kick off my new Seize The Sketch design team assignments with the May 27th sketch, but here I am with a card for the current one! Glad I found time to play. I used a strip of an antique (vintage?) book page behind the espresso panel, and a couple of retired Stampin' Up! patterned papers. 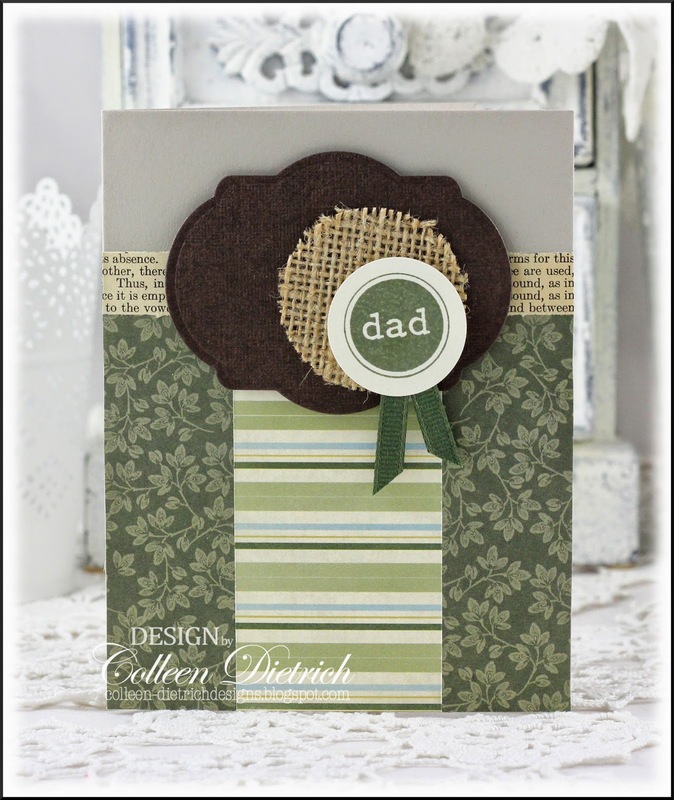 'dad' is from Lizzie Anne Designs Monthly Mix May 2010 'Dream Big' collection. I intended to make two identical cards, but don't you know...a mistake happened. Grrrr. 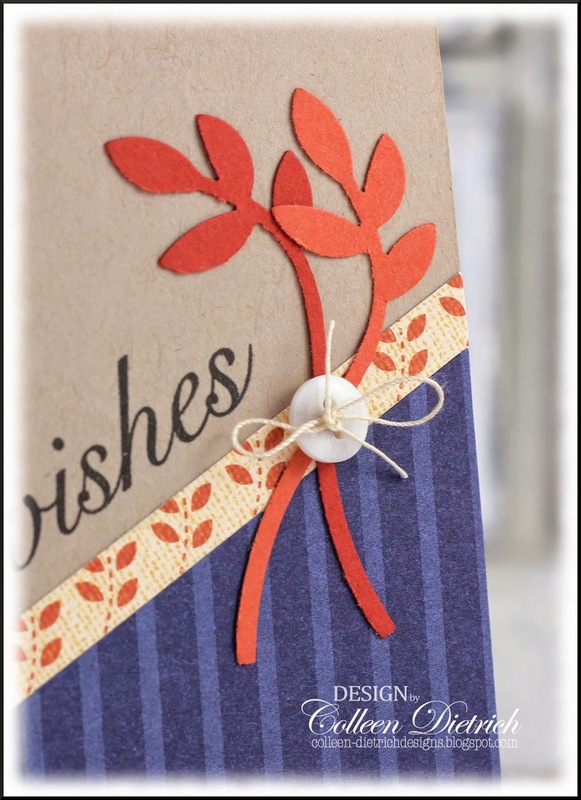 I trimmed one leafy patterned strip too small, which meant I needed to cover up the gap with skinny cardstock strips. 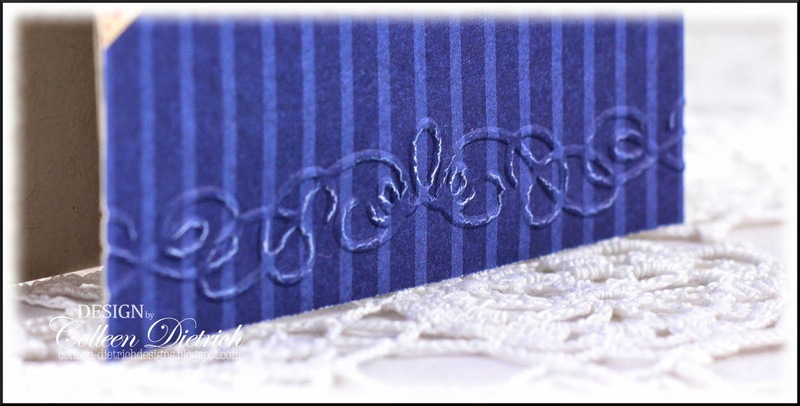 I chose blue to pull out one of the stripes from the patterned paper, but am not sure I like the color here. Inside both cards, I stamped a Monkey Paw Fern from Rubber Stampede in deep green ink. The same image graces the envelopes, too (not pictured). There's still time to play! Link up your card HERE before May 25th to enter. Thanks so much for your visit today. I really appreciate it! 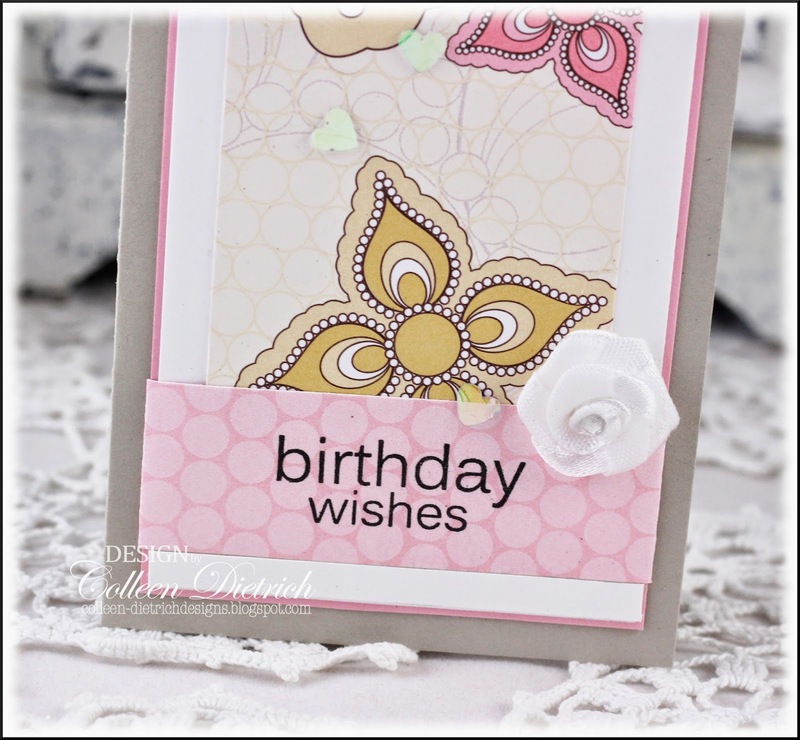 It's been ages since I used Tres Chic background stamp from Stampin' Up! I let it drift off the edges so I could enter Addicted To CAS's "Off The Edge" challenge. 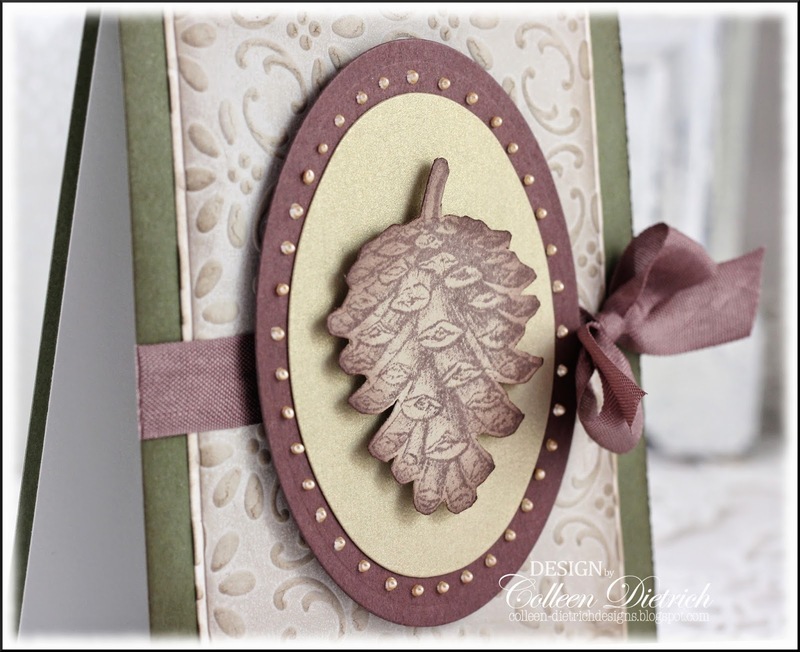 This Spellbinders Fantastic Flourish One die reminds me of a sprig of mistletoe at Christmastime. With these colors, and some amethyst gems, I think of it as mistletoe for spring! "Oh, hubby, where ARE you?..." 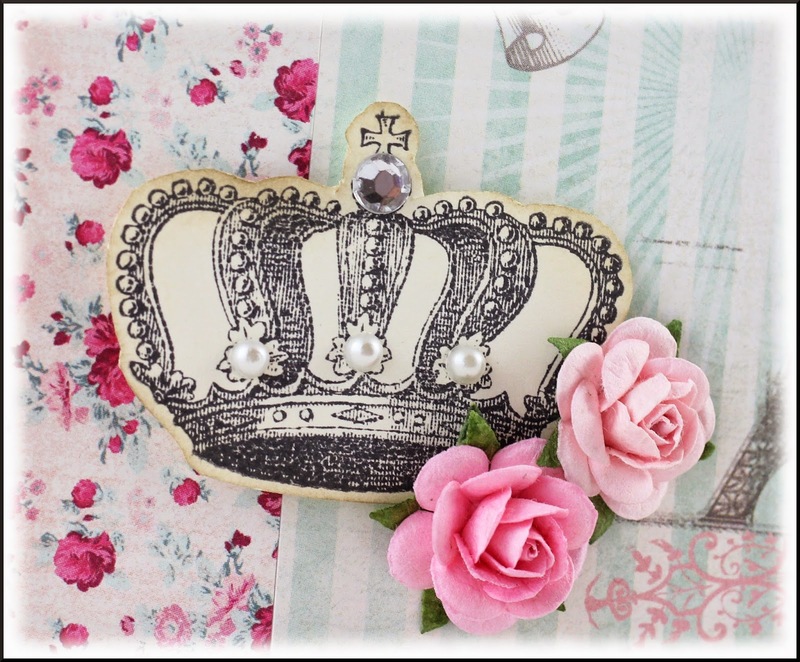 Stamps: Tres Chic - Stampin' Up! 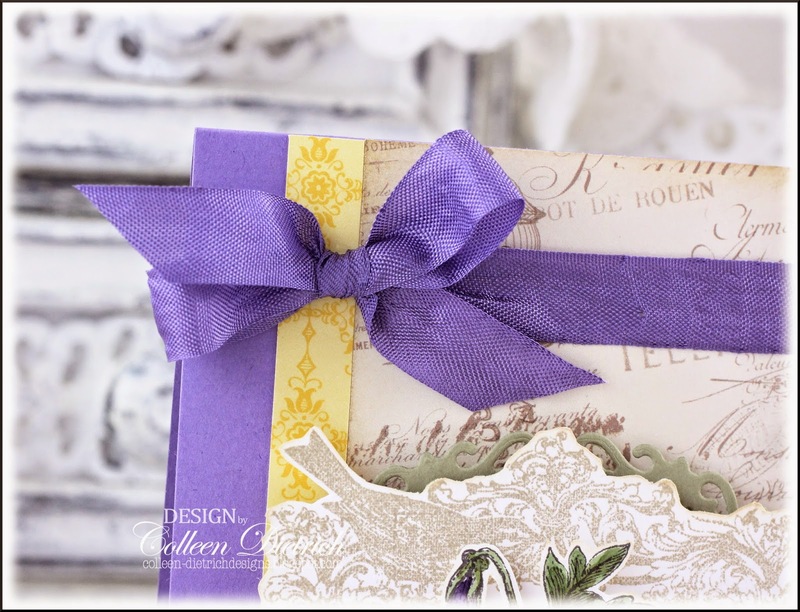 Paper: Perfect Plum, Mellow Moss - SU Ink: Perfect Plum, Mellow Moss, Elegant Eggplant - SU Fibers: white satin ribbon Accessories & Tools: Fantastic Flourish One - Spellbinders; amethyst gems - Queen & Co. 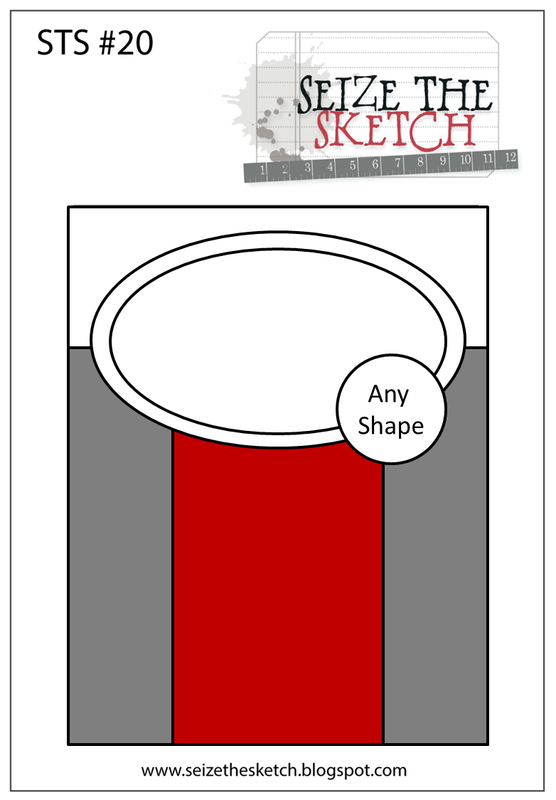 I'm joining the design team at Seize the Sketch, run by my sweet, talented and fabulous friend, Lesley Croghan. 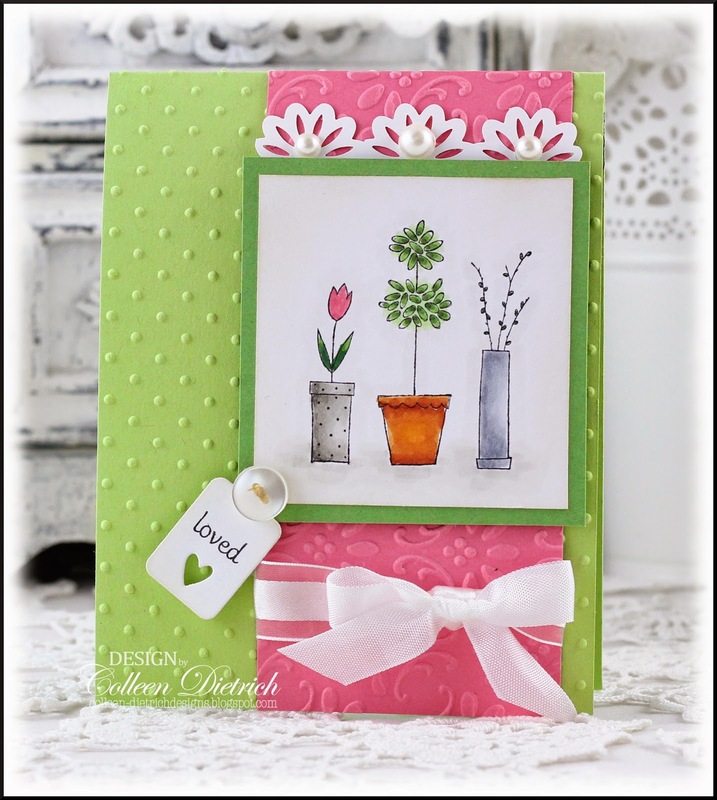 STS is a bi-weekly sketch challenge, with a team of oh-so-talented crafters providing inspiration. A huge thank you to Lesley for asking me to be on the team. So excited to be part of the fun!! Super-neutral, super simple designs for these two. 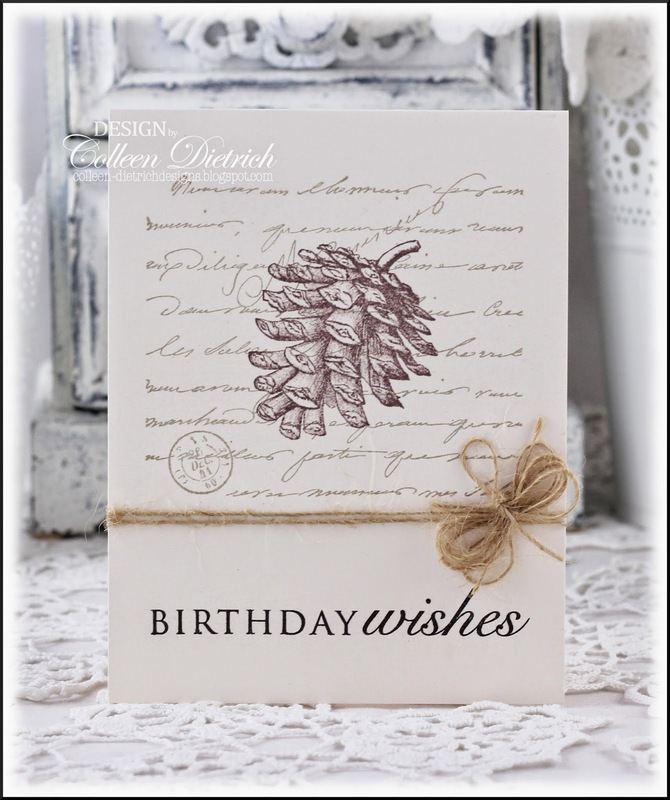 I used Hero Arts Manuscript Background, then topped it with a pinecone in the card above, and a fern in the card below. 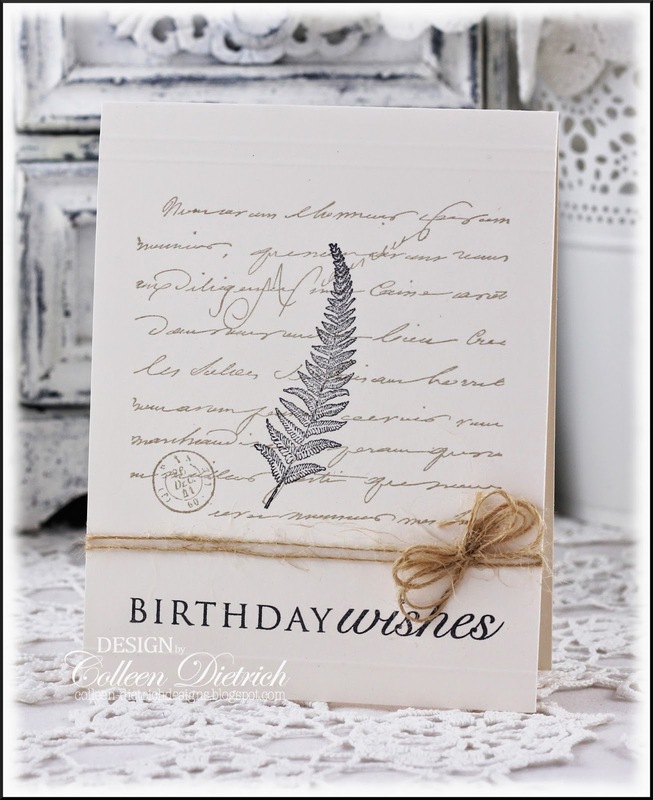 A big birthday sentiment from Papertrey Ink and a bit of twine were finishing touches for these cards. On the next card, my 12 YO told me it looks like it needs a sentiment. The perfect symmetry was hard to mess with though, and I only allowed a small bow off to one side. No sentiment on the front. 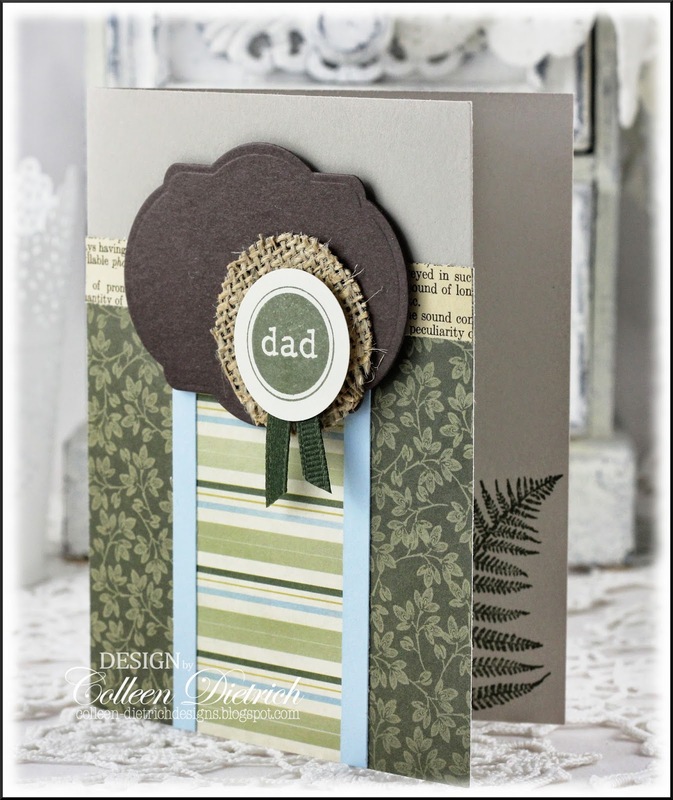 With the Liquid Pearls, bow and shimmer from the golden cardstock, I'm not sure if we can EXACTLY call this a masculine card. More along neutral lines, maybe? I also washed windows, and though that sounds as boring as watching paint dry, it gave me pleasure to look through crystal-clear glass once again. I'm weird like that. Ha ha. I've left my favorite Mother's Day creation for last this week. 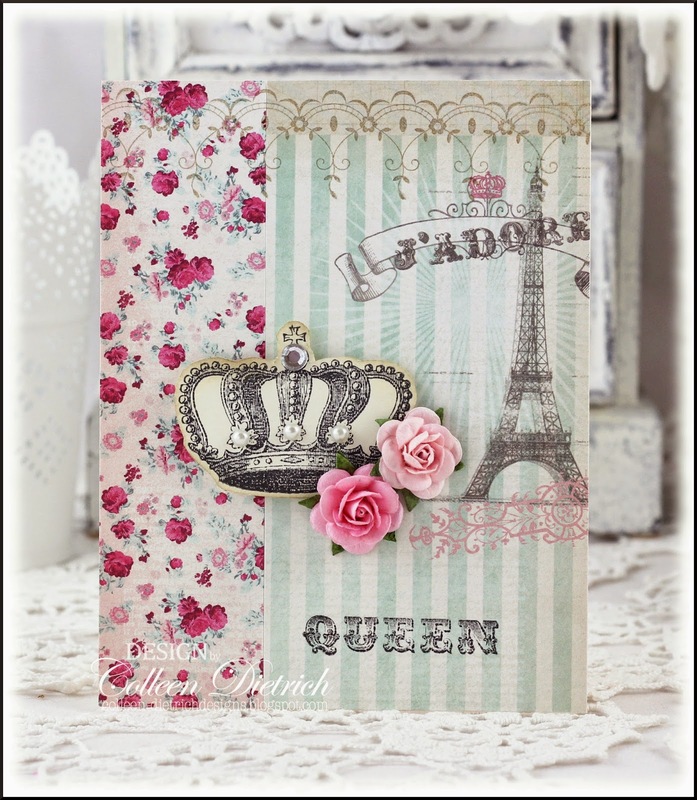 :-D Well, you know, there's the Eiffel Tower, and pearls, and a lacy stamp, and roses, and that beautiful crown. What's not to love? 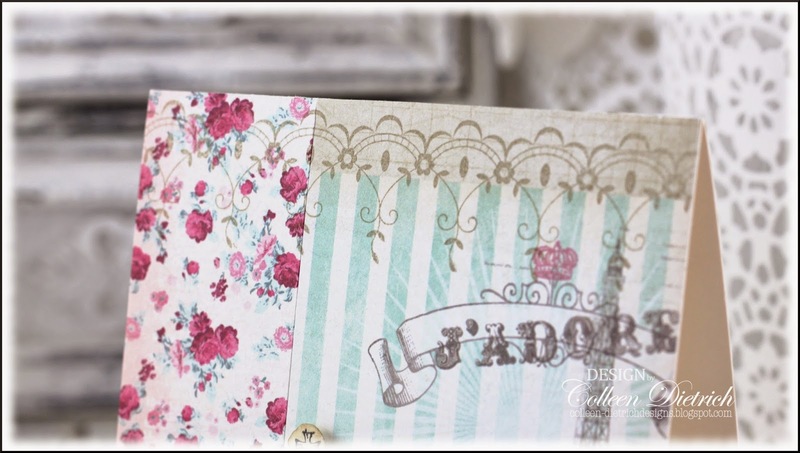 I used My Mind's Eye Lost & Found Blush patterned papers, then stamped a lacy border across the top. 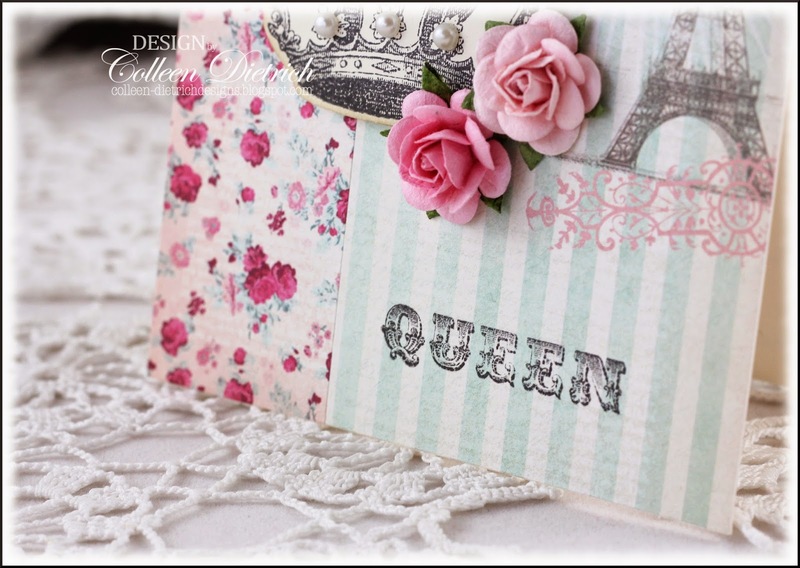 I've been getting good use out of Queen Bee by Pink Paislee this Mother's Day season. LOVE the crown. The sentiment is from Queen Bee, too. 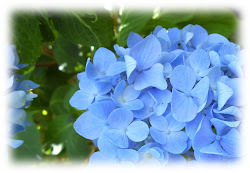 I wish you a most beautiful Mother's Day this weekend, my friends! Hi friends! 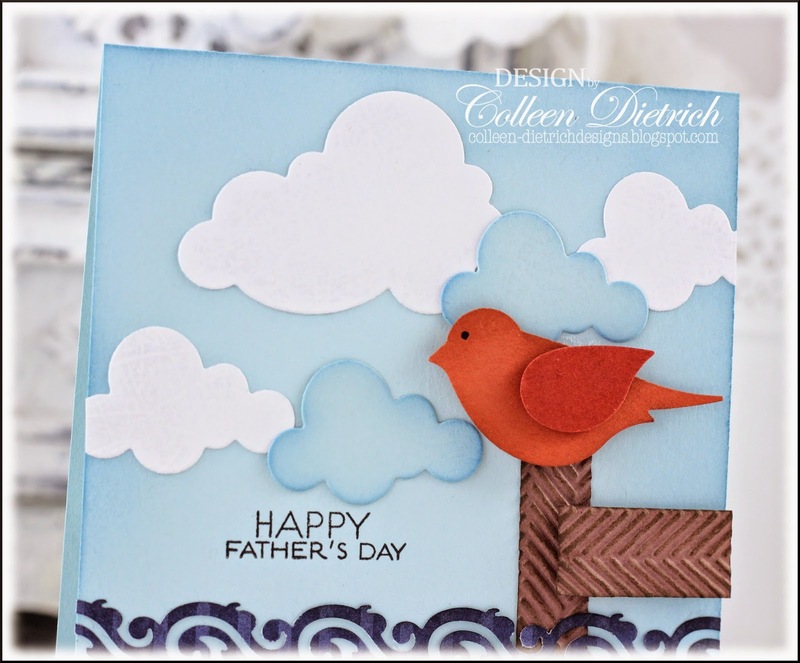 For today's Mother's Day card, I pulled out an oldie-but-goodie Stampin' Up! set, Flowers of Gratitude. I love the old-fashioned feel of these stamps. 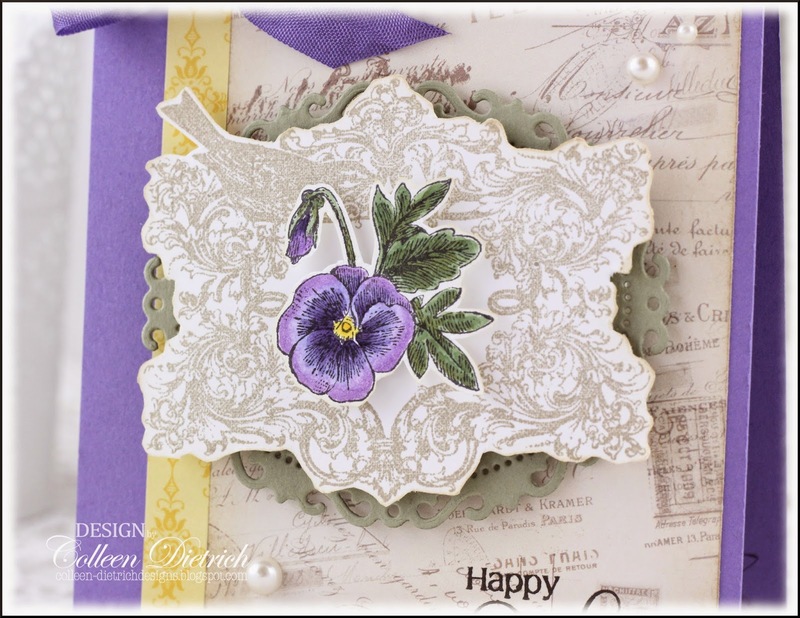 The pansy is one of my favorite flowers, and was also a fave of my husband's grandmothers. The trimmed-out flower was set on a pale Country Estate Frame by Unity, which was also fussy-cut. 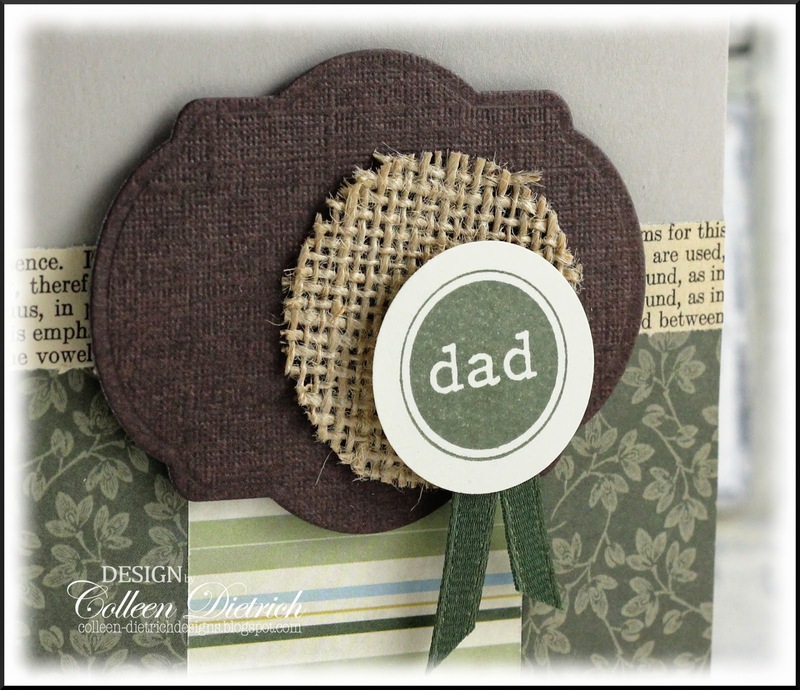 They were both mounted on a moss green fancy oval die cut. I wanted to bring in some of the green in the leaves by adding that oval. Thanks so much for coming by today! I've got one more Mother's Day card to share this week, so see you soon. Hello again! This Mother's Day card is destined for my own mom, who adores the color black. 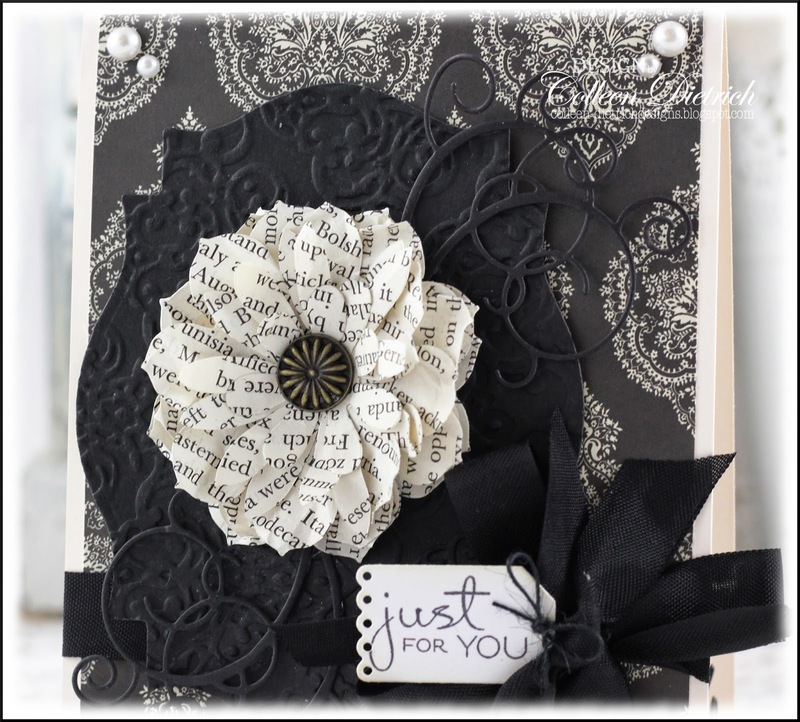 I used some old book pages and the Blossom Party dies from Stampin' Up! to create my flower. It's easy to pass through multiple thin pages at once thru my Big Shot. Then I crumpled up the blossoms, unfolded each and layered on one another, topping with a gorgeous bronze brad. 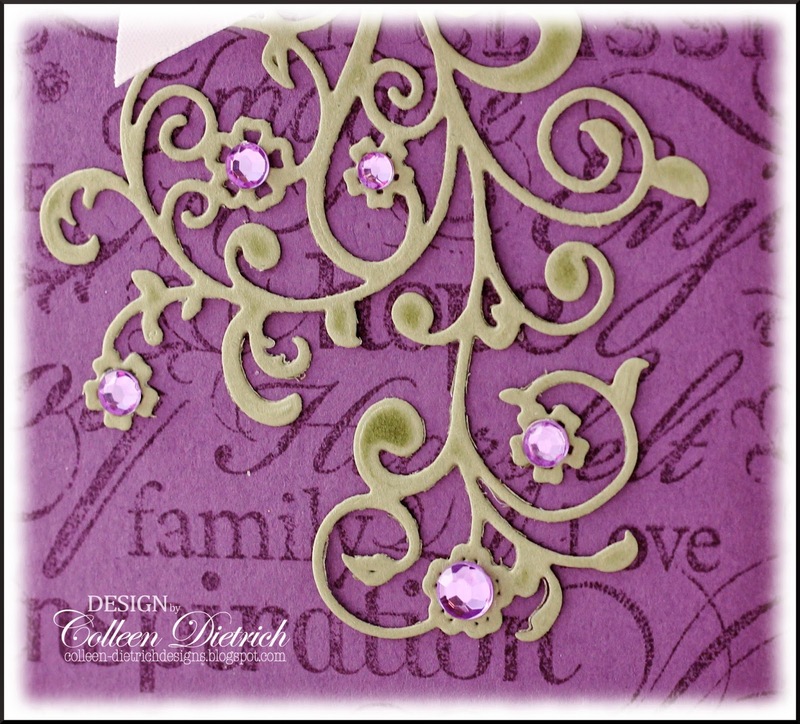 It was fun playing with a new-to-me embossing folder from SU called Lacy Brocade (it was on clearance). 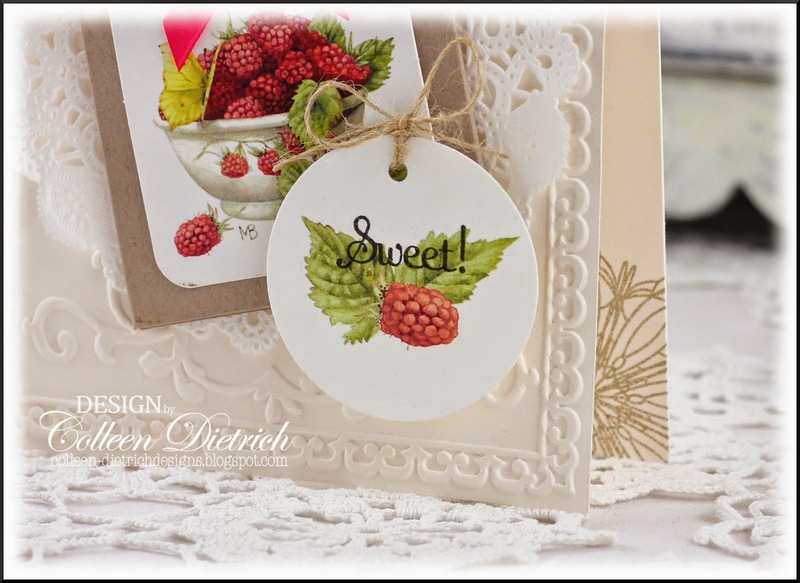 After die-cutting a label, I used the embossing to create more texture. 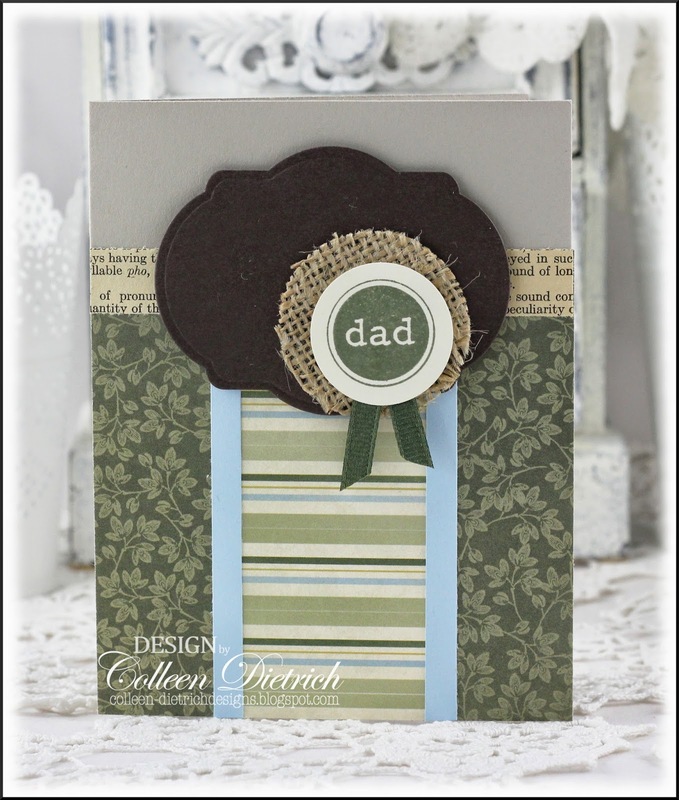 That wasn't enough to suit me, so I added in some flourished die cuts from Memory Box. Welcome! I've got a simple design for Mother's Day, but with lots of extra details. 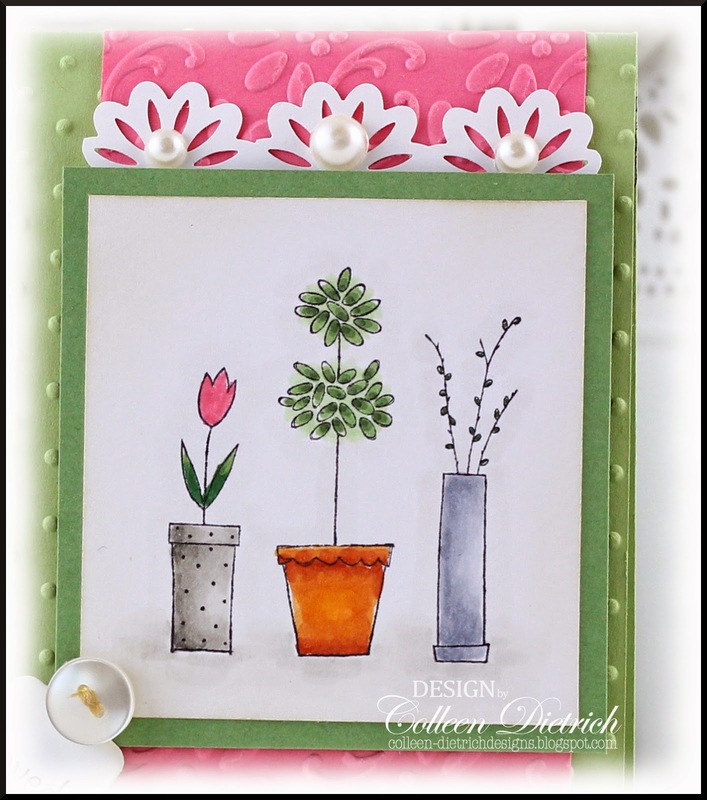 I used an image from an older Stampin' Up! set, Blooming With Love. This card is for my MIL, and she does love her plants! I used mostly Copic markers, but touched up some leaves with the skinny end of a Garden Green SU marker. 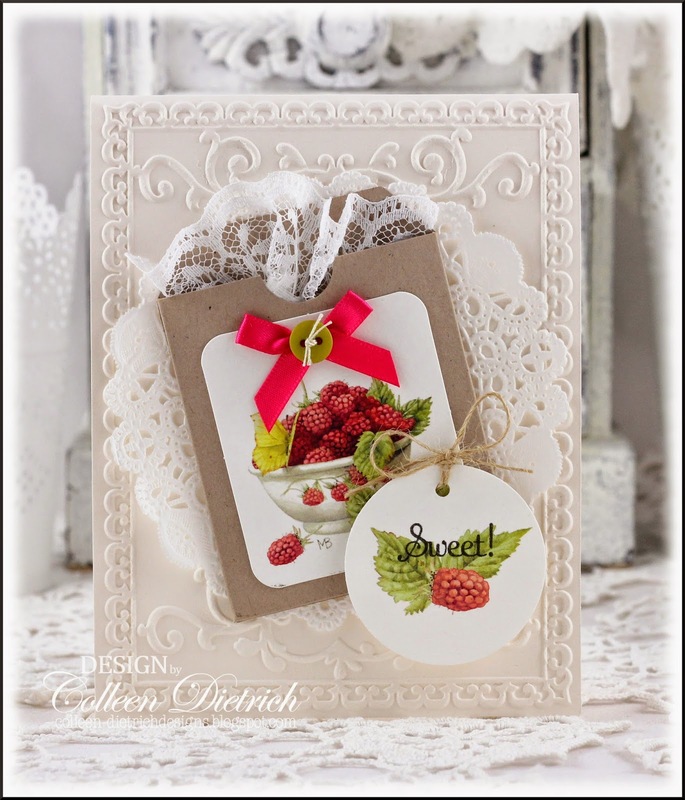 The image is matted with Wild Wasabi, which coordinates well with the colors of the card. A border of punched flowers and pearls made their way on here, because it looked too plain without them. 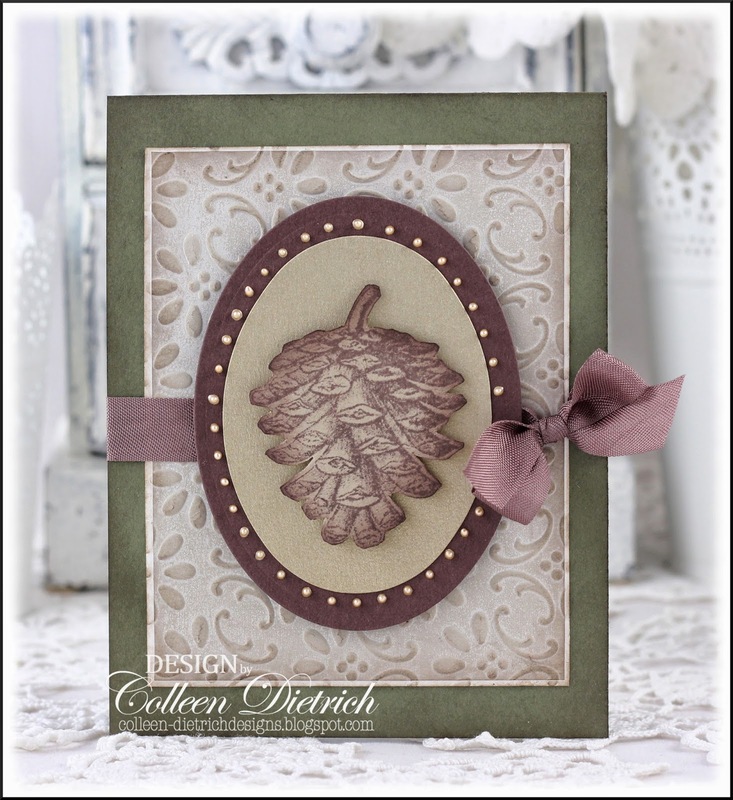 The celery card base was embossed differently than the rose strip of cardstock, for extra dimension and interest. And the little Papertrey Ink tag was selectively stamped with part of a sentiment from Verve's Small Phrases. The entire stamp says 'you are loved'. Also, I added a snippet of sheer/satin striped ribbon with a simple knot, but then rethought it. It did not look right without a bow, but my snippet was too short for that. Used a piece of seam binding instead and glued it on. I think it looks okay this way, don't you?